First, mix your nut butter syrup. Combine ingredients in a small bowl and stir until smooth. For thinner syrup use more water. Set aside. Preheat waffle maker to manufacturer’s instructions. In medium size bowl, combine the flour, cocoa, sugar, baking powder, salt. Add nut milk, oil and vanilla, mix until combined. Pour batter on to waffle iron, close and cook about 3 – 4 minutes (or according to your waffle makers instructions). Gently remove waffles and serve right away. You can also keep waffles warm in a preheated oven at 200 degrees F., keep waffles on a cookie sheet until all waffles are ready. 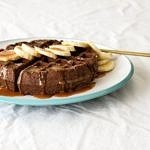 Serve with the maple nut butter syrup and sliced bananas. Store any leftovers in the refrigerator or freezer. If freezing, when ready to use let thaw. Toast your waffle and you’re all set. Makes 2 extra large waffles (the size shown here) or 6 – 8 smaller ones. Make vegan buttermilk: Add juice of 1/2 large lemon to non-dairy milk and let set for about 10 minutes. If using coconut oil, be sure to warm the milk or use room temp milk. Cold milk will solidify the coconut oil making it lumpy. For best results, warm the milk and coconut oil together. These will turn out just as well without any oil added. Waffles shown are oil-free.